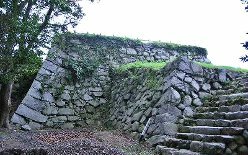 Obama Castle is classified as a flatland castle (its layout: Rinkakushiki), and is located in Fukui Prefecture. During the pre-modern age, it found itself within the borders of Wakasa Province. 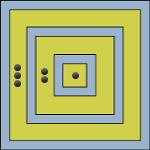 It is associated with the Kyōgoku, Sakai clans. Dates in use: 1601 - 1871. Almost completely surrounded by water, the setting of this castle is just fantastic. It sits on the shores of the Sea of Japan, on a needle-like peninsular formed by two rivers. Classified as a Flatland castle, it easily satisfies the criteria of Water castle. The original castle was quite a compact site with a large number of turrets, bridges & gates. 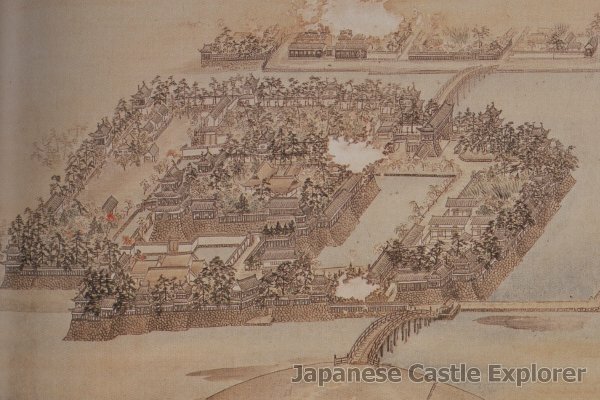 It was one of a select group of castles that had retained its main tower for most of the Edo period. Nowadays, the castle is all but forgotten. Though, I do notice Obama trending on Twitter. Curious. The stonework of the inner-most enclosure has survived to the present and sits amongst a crowd of houses. 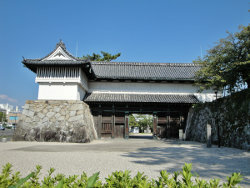 1601 Construction of the castle was initiated by the Kyōgoku Clan. 1634 The Sakai clan were transferred here. 1636 The three-story central tower was completed. 1871 The majority of the buildings were torched. The central tower would last a few more years. 1872 Sections of stonework on the eastern side of the castle were dismantled. 1874 The castle was finally decommissioned, and the main tower was brought down. 1875 A shrine was built in the main enclosure of the castle.